"by 2048, all commercial fish stocks will have “collapsed,” meaning that they will be generating 10 percent or less of their peak catches." Let's remember to drink local, and eat low on the food chain. Pop a tin, and tell us about it. Back when I was poor I fantasized about living off of dirt cheap survival food. I was going to buy in bulk to save money. I was going to get 50 gallon drums of dried pinto beans, corn, wheat berries, sugar, vegetable oil. Then, all I would need was water, a hand grain mill and fuel to cook with. The fantasy was nothing more than that. Another thing that I never tried but seemed promising was the idea of farming fish. Somewhere out there on a kooky survivalist's website were plans to build a catfish farm out of an old 50 gallon drum. Supposedly you could do this in your backyard or behind an apartment. Now how close to "eating low on the food chain" does home fish farming get to? I guess it depends on what you feed the fishes. I've heard catfish will eat anything so it might be viable. 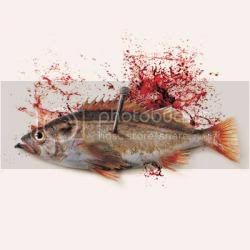 Now, I prefer sardines but I'll eat just about anything that swims if its sustainable. Thoughts?